Nasty! Why Do We Put These Things In Our Mouths? 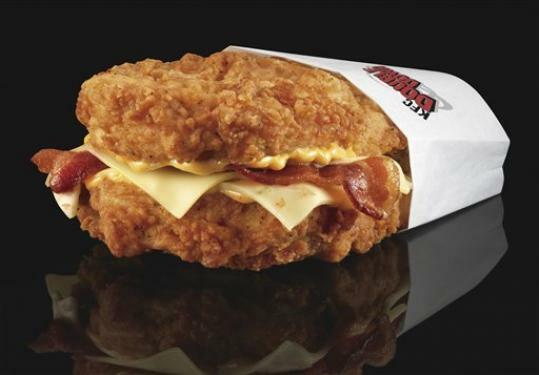 This fat laden “sandwich” consists of 2 slabs of crispy chicken breast enveloping two pieces of bacon and two slices of cheese (Jack and Pepper Jack), with “secret sauce” glueing everything together. Granted this is not a true sandwich as there is no bread. The chicken is the bread in a matter of speaking. KFC uses this as a marketing plus! “HEY! This fab Double Down creation is low carb and lower in calories because it has no bread! AND we are donating the cost of the buns this monnstrosity would sit on to charity!” Wow, you are such frackin’ humanitarians KFC. What about the sodium and the fat? What about the people who will eat two of these (because you know they are out there). I’m sure these grease and fat creations are a gift to the American people. Why pick KFC? I know there other egregious food items out there. My fav site for oggling disgusting pictures of food no one should ever eat is http://thisiswhyyourefat.com/ I would just hope the majority of you know what is real food, what is good food, what is healthy food and what is crap. Let’s make the right choice. I know you can! Posted on April 12, 2010, in Uncategorized and tagged bad food, chicken, fat, KFC. Bookmark the permalink. Leave a comment.